A CHOICE Outstanding Academic Title 2012!Based on case studies from public schools in Toronto, Canada, this book chronicles an inspiring five-year journey to develop thinking about and teaching literacy for the 21st century. The research, which was classroom-based and developed by public school teachers in collaboration with university researchers, was stimulated by an ethnographic study at Joyce Public School to track children learning to read in an era of multiliteracies. 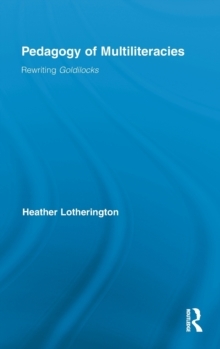 Following the kindergarteners' interest in Goldilocks and the Three Bears, Lotherington asked the principal: What would Goldilocks look like, retold through the eyes of the children? The resulting classroom experiment to transform learning to read a storybook into multimodal collaborative story-telling sparked the development of an award-winning school-university learning community dedicated to the development of multimodal literacies in the culturally diverse, urban classroom. Pedagogy of Multiliteracies tells the evolving story of teachers' trial-and-error interventions to engage children in multiple modes of expression involving structured play with contemporary media. Using the complex texts created, the teachers carve spaces to welcome the voices of children and the languages of the community into the English-medium classroom.